Guys, I’m a good cook. No, like, really. I’m a really good cook. I love cooking, and I love trying out new recipes. I know, that doesn’t sound like much of a confession. That was just the backstory. But no, I do not love cooking for one. In fact, I try not cook just for myself because I have leftovers for years. well, I just eat like a bachelor(ette). 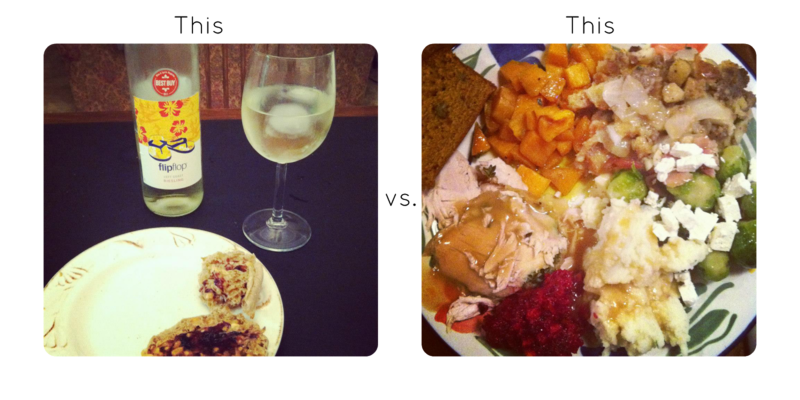 For example, last night was a pb & j night…plus wine. Why wine? Well, I need the wine bottles for centerpieces for my wedding. I’m just too lazy and to stubborn to cook for just myself. I’ll be cooking the Thanksgiving feast for the family again this year per tradition. And yes, all that feasting you see up there? I devoured it, and then I passed out.